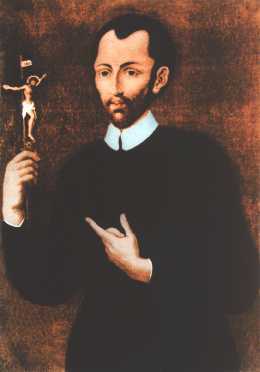 Saint Alphonsus Liguori (b. 27 Sept. 1696, d. 1 Oct. 1787) is best known for his Moral Theology writings. Alphonsus founded the Redemptorist Congregation. He made great pastoral reforms in the pulpit and confessional, replacing the pompous oratory of the time with simplicity. For nearly ninety years he had been a model of holiness, prayer, and mortification. Alphonsus fought against Jansenism, which later became condemned as heretical. He spent twenty-six years on the road preaching in the Kingdom of Naples. Saint Alphonsus was made bishop of Palermo at age 66. His life was filled with illness, eight times, he was administered the sacrament of dying. He was declared "Venerable", 4 May 1796; was beatified in 1816, and canonized in 1839. In 1871, was declared a Doctor of the Church by Pope Pius IX. Born as Alphonsus Marie Antony John Cosmos Damien Michael Gaspard de Liguori, to saintly parents. His father, Don Joseph de' Liguori, was a captain of the Royal Galleys navy. His mother was mentioned to be of Spanish descent. Alphonsus was baptized two days after his birth. He was the oldest of seven siblings. At age 16, he received his doctorate from the University of Naples in both canon and civil law. By age nineteen, he was practicing law until he had a vision while visiting the Hospital for Incurables. The vision said to consecrate his life solely to God. In response, Alphonsus gave up law and dedicated himself to the religious life. He was ordained a priest on December 21, 1726. He lived his first years as a priest with the homeless and marginalized young people of Naples. He founded the "Evening Chapels". Run by the young people themselves, these chapels were centers of prayer, community, the Word of God, social activities and education. At the time of his death, there were 72 of these chapels with over 10,000 active participants. Alphonsus founded the Congregation of the Most Holy Redeemer on November 9, 1732. Nearly one-year later, all members but one had left to start another religious order. He started again, recruited new members, and in 1743 became the prior of two new congregations, one for men and one for women. Pope Benedict XIV gave his approval for the men's congregation in 1749 and for the women's in 1750. Saint Alphonsus might have been free to develop his work in comparative peace. However, the State demanded authority and anti-clericals were refusing new orders, with exceptions. This became a lifelong struggle. His missionaries received State recognition of the Institute as a religious congregation till the day of his death. Several years before his death, an elderly Alphonsus had been tricked into signing a submission for royal approval of his congregation. The very vows of the religion order being abolished. Alphonsus was denied any authority among the Redemptorists. Deposed and excluded from his own congregation, Redemptorists were transferred from Alphonsus's care and put under Papal authority. He had prophesied that after his death, the Neapolitan Government will at last recognized the original Rule, and that the Redemptorist Congregation was to be reunited under one head. He says "Rest assured that the Congregation will stand until the end of time, for it is not my work but God's." This actually took place in 1793. Alphonsus theology writings were incredible. Prayer, love, his relationship with Christ and his first-hand experience of the pastoral needs of the faithful have made Alphonsus one of the greatest theologians. He wrote 1,451 letters filling three large volumes, on spirituality, dogma, ascetic matters and theology. His best known contribution to the Church was his works on Moral Theology, which celebrated Jesuit morals, whom he calls "the masters of morals". As testimony to his vast knowledge, Alphonsus made 80,000 citations from 800 different authors. 21,500 editions and the translations into 72 languages that his works have undergone attest to the fact that he is one of the most widely read authors. Other renowned works, Visits to the Most Blessed Sacrament and the Glories of Mary. An attack of rheumatism in 1768 left him partially paralysed. At the age of 78, Alphonsus was allowed to retire to live in the Redemptorist community in 1775. He suffered a final 18 months of “dark night” scruples, fears, temptations against every article of faith and every virtue. Alphonsus died August 1, 1787 and he was buried at the monastery of the Pagani near Naples. Nearly 200 years later, there are more than 7,000 men carrying his spirit forward as Redemptorists. This page was last modified on 12 July 2016, at 20:23.